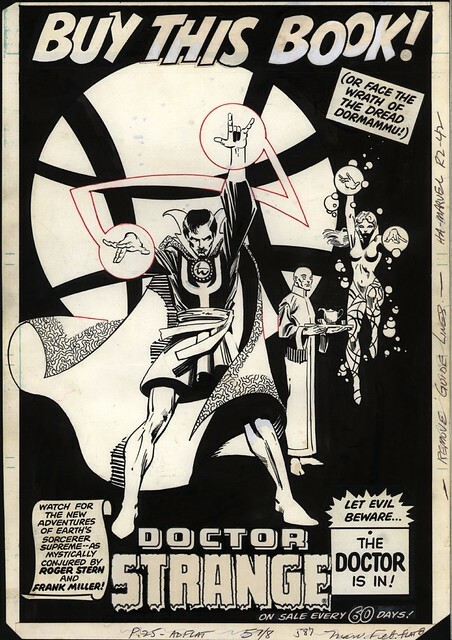 Roger Stern and Frank Miller on Doctor Strange! At that time Stern was one of my favorite writers, he was doing great entertaining work on various titles. He seemed to understand Marvel characters. And Miller had been doing Daredevil, really good work there although he may not have taken over as writer yet - certainly this was before he introduced Elektra. Here is the original artwork to this Marvel ad. Alas it was not to be! Miller got too busy with other commitments to take on this series. 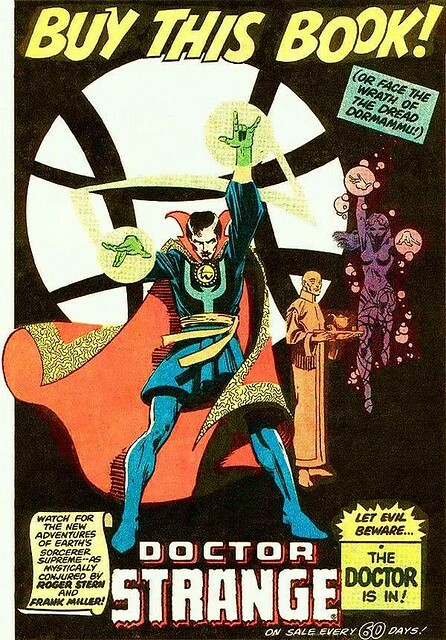 Marshall Rogers joined Roger Stern on Doctor Strange, and they did one of the greatest 6 issue arcs in the history of that title. 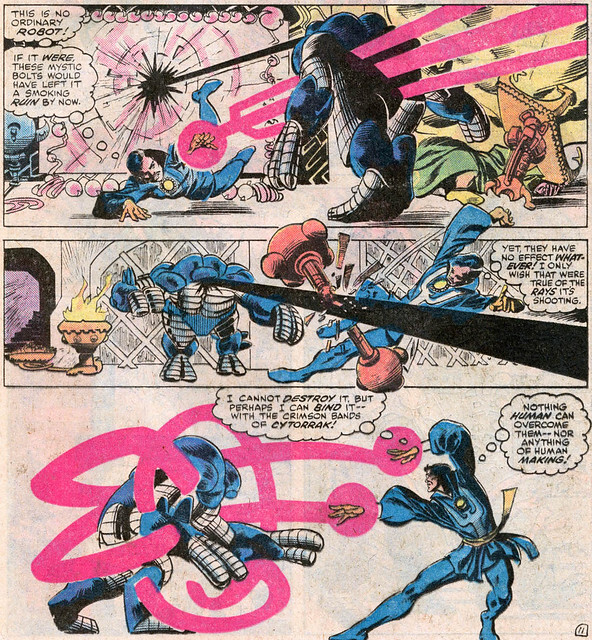 Frank Miller had whetted our appetite for his approach to Doctor Strange with his work on Amazing Spider-Man Annual 14. This annual featured Spidey teaming up with Doc to fight the "Bend Sinister" (which sounded at first like a strange sexual position) a bad guy infused with mystical powers from Dormammu with a little help from Doctor Doom. 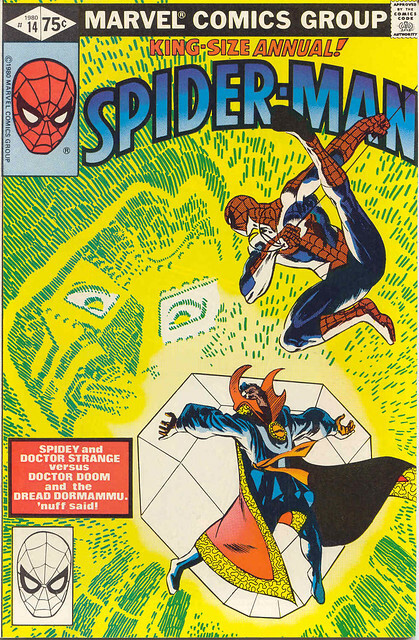 This annual was one of the best Spidey /Doc stories from the 1980s - I highly recommend it. 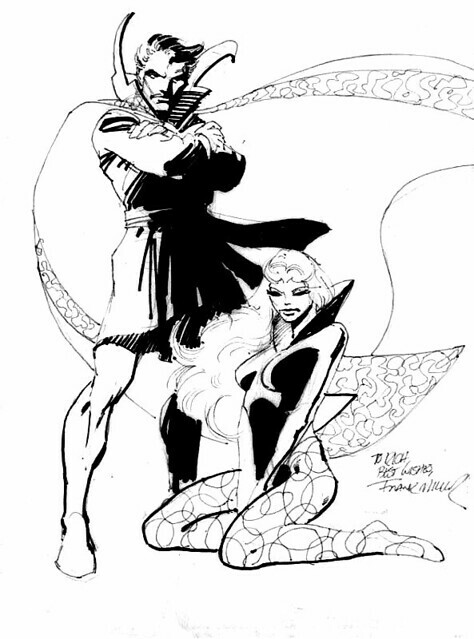 Some time later, Miller also did a commission for a fan with Doc and Clea. Pretty sweet! By the Hoary Hosts of Hoggoth, what might have been! Nuff said.